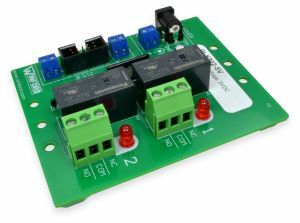 This relay board provides a convenient way to add relay outputs to your project, allowing you to switch high-current loads such as AC appliances, motors (up to 1/3 HP at 120V AC), and more. This board includes two SPDT relays, logic-level relay driver circuits, and protection diodes. Simply provide the board with power, connect your logic-level signals to the inputs, and the relay contacts are ready to use. The relay contacts are electrically isolated from the rest of the board, which allows the board to be used in a wide variety of applications, including both AC and DC loads. With this relay board, a logic-level signal (e.g., 3.3V or 5V) or higher-voltage signal (up to 25V) can be used to control a relay. Examples of logic-level signals include the outputs of a PC's parallel port or a microcontroller's output pins (e.g., Arduino or Raspberry Pi). Note: These relay boards are replacing an older design. To see the details of the legacy design, go to the Relay 102 series. 5V Power (Coming Soon): See the legacy design for immediate purchase. 24V Power (Coming Soon): See the legacy design for immediate purchase. Relay Board, TTL, 15A SPDT, 2 relays, 12V DC, DIN Rail Mount. Very similar to RLY102, but updated driver IC. Relay Board, TTL, 15A SPDT, 2 relays, 12V DC, Feet. Very similar to RLY102-12V-FT, but with updated driver IC.